Winter is a hard time for garden birds. They need to eat a lot in order to keep warm and survive the cold nights, but falling temperatures make their regular food supplies scarce. Putting up feeders is one solution, but many garden plants double-up as life-saving food resources for garden birds and no one has to remember to fill them! The seeds and berries of many plants provide nutrient rich snacks from late summer into winter, whilst others hide tasty insects in their stems and foliage or provide sheltered roosting spots. 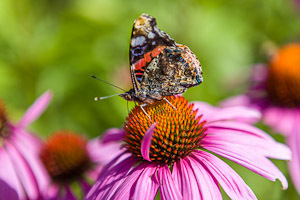 Here are five of the best bird-friendly plants to include in your garden. 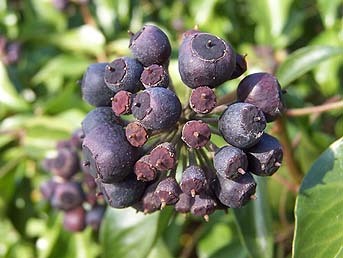 Ivy (Hedera helix) is one of the very best sources of both food and shelter for overwintering birds. Its distinctive creamy white flower heads appear from October onwards and their nectar attracts insects for robins and wrens to feed on. The large black berries which follow are devoured by a whole range of birds, including blackbirds, song thrushes and starlings while the dense foliage provides roosting spots out of cold winds and shelter for hibernating insects which make more snacks for the birds! Gardening tips: Only mature plants over one metre in height will produce flowers and berries and ivy that’s kept tightly clipped year round won’t get a chance to flower either. Try to keep at least a section of ivy in the garden that can get a bit messy and wait until early spring to get the shears out. 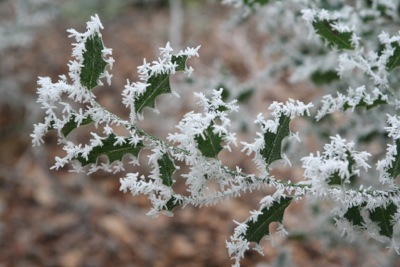 Holly, ivy’s traditional companion, is also well worth considering as part of a bird friendly garden. Birds prefer red berried varieties such as our familiar native species, Ilex aquifolium, or English Holly, with its glossy, very prickly dark green leaves and abundance of small red berries from late autumn. As well as feeding the birds, the berries provide a long-lasting splash of colour over winter as they ripen in late autumn, but don’t tend to be eaten until later winter. Like all hollies, Ilex aquifolium is very slow growing, but will eventually reach 10 metres and make a very elegant architectural specimen tree for a large lawn or woodland planting. 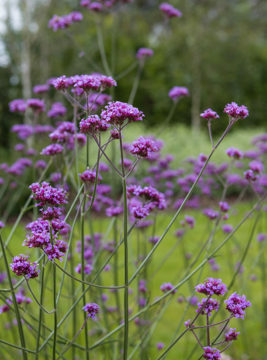 Beware if planting in a border as the leaves will make weeding very painful! Hollies thrive in any soil as long it is not waterlogged and tolerate pollution, winds and seaside conditions. Gardening tips: Only female plants produce berries and require a male plant for fertilisation, so, unless you know you already have a male plant nearby, it’s safest to plant both. 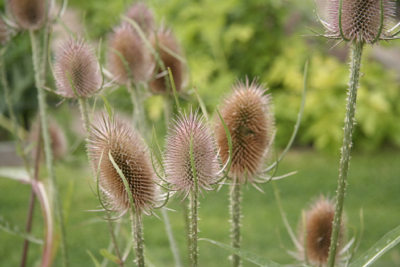 It isn’t necessary for the male to be the same species so go for something contrasting, like ‘Silver Queen’ with its distinctive silvery margined leaves and purple stems. 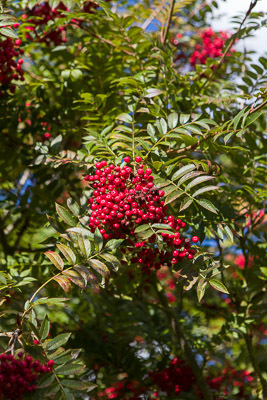 Another all-time berrying favourite with birds is Sorbus aucuparia, otherwise known as the Mountain Ash or Rowan. Its large bunches of deep red berries are a rich source of food for numerous species. And if you’ve ever seen them glowing against a bright blue autumn sky, you know it isn’t just the birds who enjoy them. This is a pretty tree in all seasons, with a naturally conical shape, dainty mid green, fern-like foliage and sprays of tiny white flowers in spring. Berrying times vary depending on variety of tree – some starting as early as August, and others not until November. It’s tougher than it looks and can tolerate harsh conditions while its modest height of 15m x 7m makes it ideal for a smaller garden. Rowans prefer full sun to light shade and slightly acidic soil, but will tolerate any soil type. Gardening tips: Rowans require minimal pruning. Remove any broken, diseased or crossing branches in late autumn or winter. The common Hawthorn or May tree, Crataegus monogyna, supports over 300 insect species and provides food and shelter for birds all year round. Shiny clusters of deep red berries, or haws, ripen in autumn and can stay on the tree until February or March to be enjoyed by many bird species including blackbirds, chaffinches, greenfinches, redwings and fieldfares. It is a small, rounded, deciduous tree with spiny branches, glossy, deeply lobed leaves and flat sprays of creamy-white flowers in May. 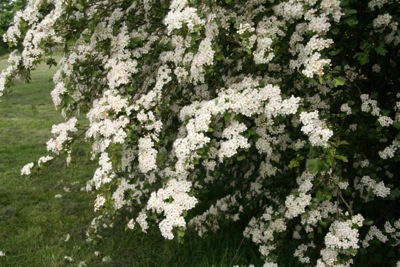 I LOVE Hawthorn blossom – a true sign that spring has arrived, and such a pretty flower. A lovely specimen tree for an informal or wildlife garden, hawthorn also makes an excellent hedge, either on its own or as part of a mixed wildlife hedge. 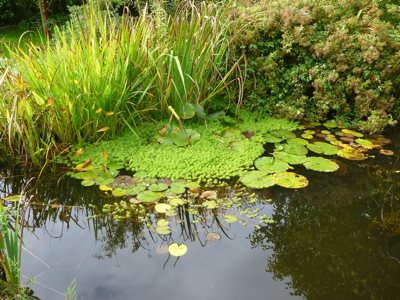 It thrives on any well-drained soil in full sun to partial shade and can tolerate exposed and coastal sites. Height and spread: 4-8m. 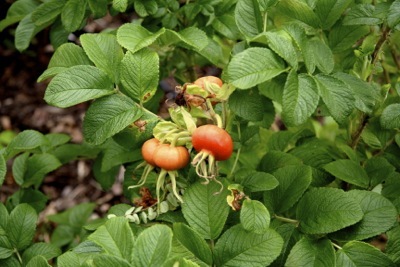 Rosa rugosa is a vigorous species rose with distinctly pleated, leathery, dark green leaves that turn a buttery gold in autumn and a constant succession of fragrant, single, yellow-centred flowers from June to September. 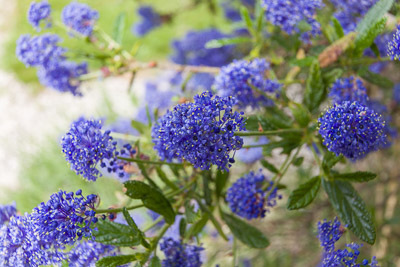 It makes an excellent informal hedge for an open, sunny site on fertile, humus rich, well-drained soil. 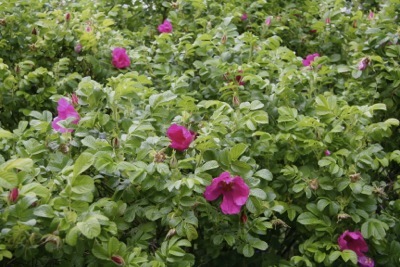 Gardening tips: Rosa rugosa requires little pruning. Remove one third of older stems every 2 or 3 years to rejuvenate the plant.